A soldiers story written by a soldier. The true story of hardship and horror in the blood and mud as seen through the eyes of a teenage volunteer and his comrades in the forgotten conflicts of Salonika and Palestine,during the great war,fighting for the freedoms of small nations and in particular,during the Great War,fighting for the freedom of small nations and in particular for Home Rule in Ireland.Then testing his extraordinary courage in the Irish War of Independence,which ended 700 years of bloody struggle and helped establish a nation. 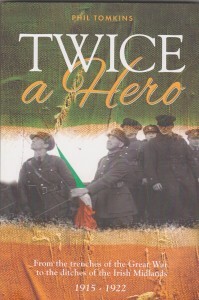 The Book is dedicated to my maternal Grandmother Mrs Annie (Nan) Hewitt(nee Adamson),men and women of the Athlone Brigade,Irish Republican Army and the many brave Irishmen of Kitcheners army who served in the Great War,who gave their lives in the mistaken belief that their sacrifice would lead to an Independent Ireland. This is a very good book, it covers the life of George Adamson,his joining the 10.th Irish division in 1915,to his induction to the Leinster Regiment and the serice of these units in Salonika and Macedonia, 1916-1917.The campaigns are covered in detail up to George’s discharge from the British Army after 4 years and thirty eight days,,he was awarded the DCM. On his return to Ireland he joined the Athlone Brigade IRA,because of his military past he was promoted to Vice O/C of the brigade. The book is very well researched and there are very interesting details regarding service in the British army in ww1 and also good detail on the Athlone Brigade in the the Irish War of Independence. It is the story of one Irishmans short life,but what an eventful life he had,and he ultimately gave his life for Ireland.